North Korea has established an association and passed a law to regulate its ginseng production and trade, but Chinese analysts and planters gave differing opinions on the potential challenges North Korean ginseng might bring to China's domestic industry. Da Zhigang, director of the Institute of Northeast Asian Studies at Heilongjiang Provincial Academy of Social Sciences, told the Global Times on Sunday that North Korea is aiming to use the law to boost its ginseng industry, which is already a great contributor to the country's economy and foreign exchange since medicinal materials are not on the list of UN sanctions against North Korea. North Korea is obviously seeing medicinal plants, especially ginseng, as a potential economy booster, Da said. North Korea's Supreme People's Assembly has passed and promulgated a law on ginseng. The 48-article law elaborates on working principles for government departments related to ginseng production, including farmland building, cultivating, trade, and subsequent processing, Korean Central News Agency (KCNA) reported on Friday. North Korea also established an Insam (ginseng) Association to supervise ginseng cultivation, purchase, processing and export, in a unified way, said KCNA in a report on Tuesday. A Chinese ginseng planter surnamed Zhang from Baishan, Northeast China's Jilin Province, told the Global Times on Sunday that he thought North Korea's ginseng law will "definitely challenge domestic industry," saying that North Korea's expanding export to China will drive China's domestic products into the corner. However, Da pointed out that the law would also bring opportunities to China's ginseng industry in the long run. North Korea has high-quality ginseng but lacks processing technology, which creates a base for bilateral cooperation. China can also help in marketing the ginseng globally in the long run, Da said. North Korean leader Kim Jong-un visited a plant of Tong Ren Tang, one of China's most prestigious traditional Chinese medicine (TCM) pharmacies, during his visit to Beijing earlier this month. At the plant, Kim inspected relevant processing and production lines that use both traditional and modern techniques. 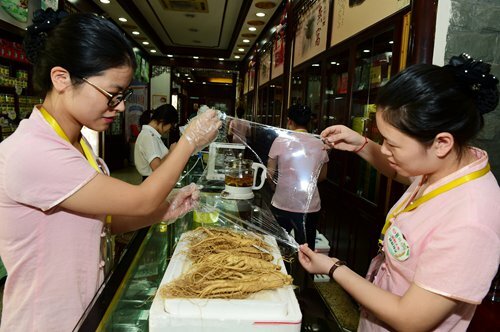 A Global Times reporter found that Chinese ginseng slices are sold from 50 to 160 yuan ($7-24) per 100 grams on Taobao, China's e-commerce giant, while North Korean ginseng is sold at about 299 yuan per 100 grams.